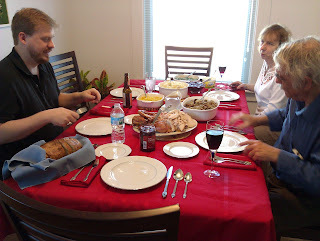 Jennifer's 365 Project: 1344/365 - Thanskgiving! We spent the day in at my parent's house in metro Detroit. They had lots variety so plenty of food for everyone. I didn't feel the greatest so i didn't eat much. I didn't even finish a slice of pumpkin pie! I neglected to snap a photo, but my little brother was there as well. All in all a good day and I made sure to steal plenty of leftovers so I can lay about for the next three days gaming and not cooking.